Feb.1, 2012 - Milford, Connecticut exceptional amount of glass- many enchanting pieces! 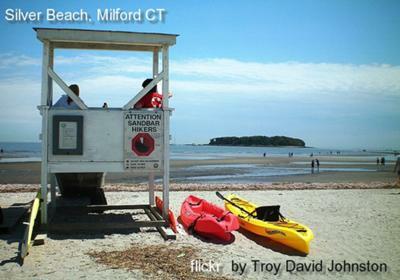 As you can see in the photos above, Silver Sands State Park in Milford has an island offshore. This island is connected by a sand bar to the mainland at low tide. It is marked as dangerous to cross to the island, as the sand bar is covered in water when the tide comes in. Silver Sands Beach is connected to the main beach in Milford by a boardwalk. 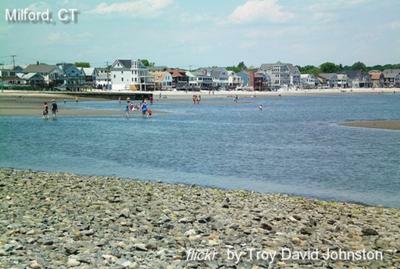 The stretch of beaches is a good mixture of sand, gravel, and rock, usually the best mix to find sea glass. However, as you can see from the map below, Milford is in Long Island Sound, which pretty much excludes signficant wave action. 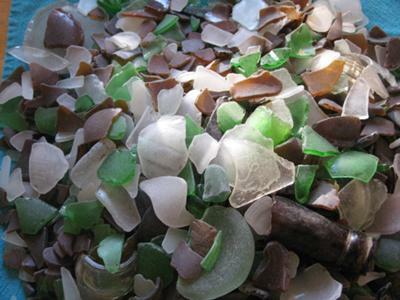 Because of the lack of much tumbling from waves, necessary to produce rounded and frosted sea glass, only a few very old pieces of sea glass are found. Colorful shards abound, though, as seen above, and many people enjoy the search for beach glass treasures along the shores of Long Island Sound near Milford, Connecticut. You may have had a disappointing experience like Arlene. We're so sorry you didn't find sea glass on this beach. 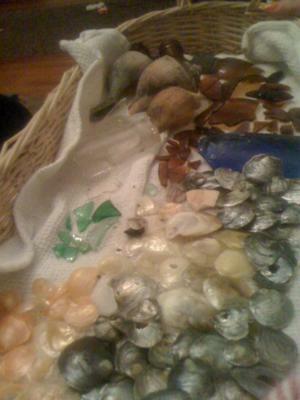 As you can see, others have found sea glass there. It is typical of all beaches that results vary from one day to the next. For example, on our local beach - Huanchaco Beach - we can find lots of quality sea glass one day and nothing the next. So it is very difficult to judge a beach by one visit. So try again. If you can meet another sea glasser who lives there, you might be able to call ahead and get some tips. Have a great time and take photos! Hi, I live on the beach in Milford, CT and EVERY time I walk the beaches I find dozens of pieces of beautiful sea glass that I use for jewelry -- brown, green, white, blue, red -- of all sizes and shades. Of course the glass does not jump off the beach and into your hands, but the search is part of the fun! Hi , I was very disappointed today to drive an hour to this beach and find only sea shells. 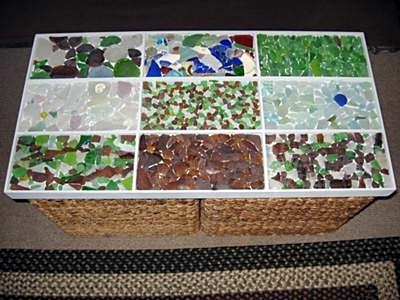 I am interested in Sea Glass! I wish people would be honest with their comments! if there is no sea glass please say so! It was a beautiful beach and enjoy the walk the air was cool and the sea air took away my frustration. I am retired, and I truly enjoy designing my sea glass jewelry! If I could only find sea glass in these areas I would be very very happy! I live on the beautiful east coast. Please send me info on beaches that has sea glass. I have found plenty in calif, thank-you!